In December 2017, Diabetic Eye Screening Programme (DESP) Clinical Leads in England were contacted via e-mail and invited to complete a brief online questionnaire about their role. The survey was conducted by the British Association of Retinal Screening (BARS) in conjunction with the National Diabetic Eye Screening Programme (NDESP) and was facilitated by Public Health England. Its aim was to gain an insight into the working practices of Clinical Leads, the role they play in the development of DES staff and variations that may exist between programmes, in order to ensure that existing policies and processes for grading are appropriate, and to identify any additional training needs and development opportunities that may be addressed by BARS or the national programme. The survey was available online for a period of approximately five weeks, and a total of 30 responses were received during this time, representing just under half of DESP Clinical Leads in England. 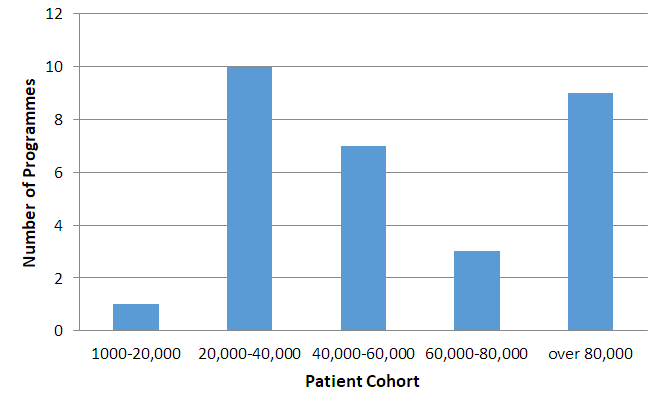 There was a great deal of variation in the amount of time Clinical Leads are able to dedicate to DESP work. On average, Clinical Leads had 2.7 Programmed Activities (PAs, generally a 4-hour session) allocated to DESP activities in their job plan, which equates to approximately 11 hours per week, but there were extremes at both ends of the scale. Two respondents stated that they have no sessions allocated to the DESP in their job plan, while another three had 5 PAs or more. 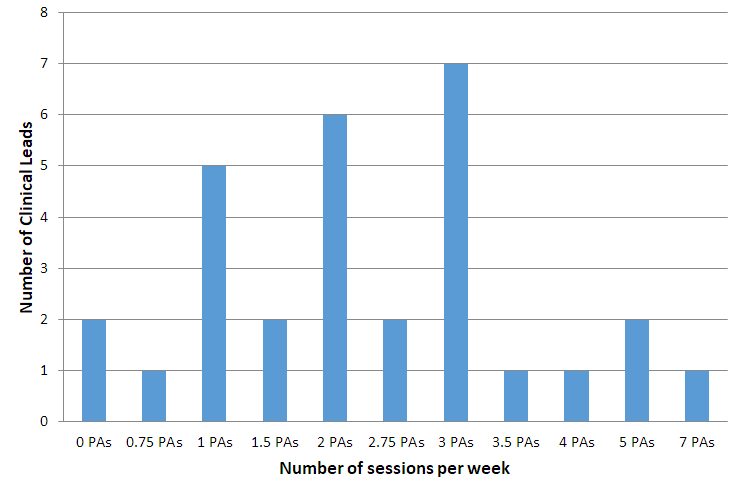 In most cases, the number of PAs did not appear to be directly linked to programme size, with some Clinical Leads of large DESPs having fewer PAs than those at smaller programmes. A large part of the survey focused on grading activities, both in terms of Clinical Leads and other DESP staff, and again great variation was found. A third of Clinical Leads stated that they don't grade at all as part of their DESP workload (this figure falls to 26% when excluding diabetologists), yet one in six spend more than 75% of their allocated DESP time on grading activities. Of those that do grade, 95% perform Referral Outcome Grading (ROG), but almost all of these will do some other form of grading too, usually Digital Surveillance and/or Arbitration. In 13% of DESPs the Clinical Lead is the only person who undertakes ROG, and in most of these cases almost all of the individual's DESP time is taken up with grading. The remaining 87% share the ROG duties with others, and in 85% of these cases (73% overall), senior graders are allowed to undertake a proportion of the ROG workload. The amount of ROG performed by senior graders varies greatly from programme to programme, however, and may be anything from 10% to almost 100% of the DESP's total ROG workload. 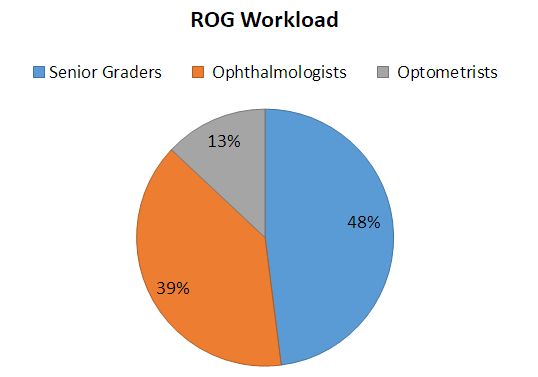 The results of this survey suggest that almost half of all ROG grading in England is undertaken by senior graders, with ophthalmologists responsible for 39% and the remainder carried out by optometrists. 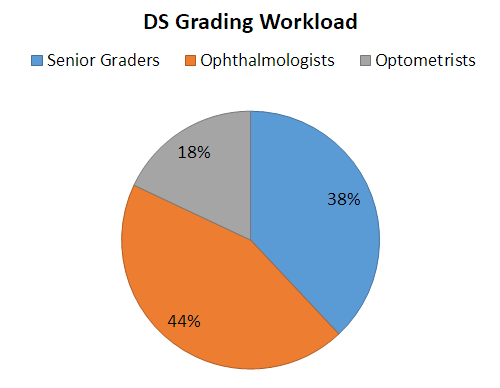 This balance shifts slightly when it comes to Digital Surveillance (DS) grading, with ophthalmologists undertaking 44% of all DS grading nationally, compared to 38% done by senior graders. The area in which senior graders have far less input is Optical Coherence Tomography (OCT) interpretation. Programmes that use OCT as part of Digital Surveillance are still in the minority, with only 8 of our 30 DESPs, or 27%, stating that they use it. Amongst these 8 DESPs, only 2 use senior graders to interpret OCT scans, and then only for a small proportion of the total OCT workload. 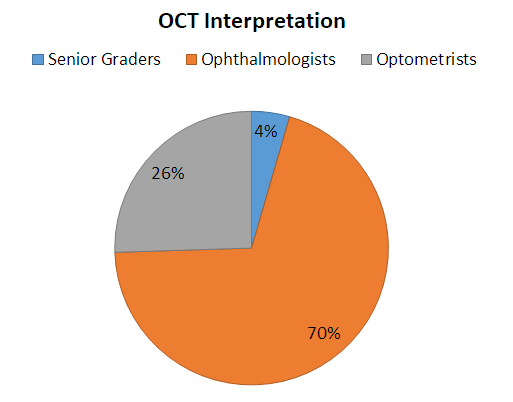 OCT interpretation is largely the preserve of ophthalmologists, who perform 70% of this activity, with optometrists completing 26% and senior graders contributing only 4% to the total workload. When it comes to Slit Lamp Biomicroscopy (SLB), 60% of programmes perform some or all of their SLB in DESP clinics, while 23% use optometry practices to some extent. HES clinics now appear to be the least common method of delivering slit lamp surveillance. A third of DESPs have senior graders performing slit lamp examinations, but they are rarely used exclusively, and in terms of the overall SLB workload, it was notable that less than 14% of slit lamp examinations nationally are carried out by senior graders. 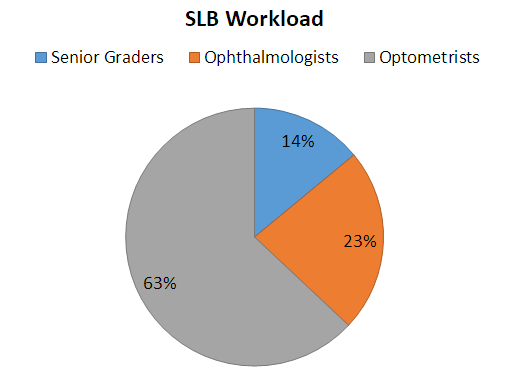 Optometrists are responsible for the bulk of the SLB workload, undertaking 63% of slit lamp examinations, with another 23% done by ophthalmologists (in either HES clinics or DESP clinics). Among the two-thirds of DESPs that don't use senior graders to perform slit lamp, 40% of the Clinical Leads said they would consider training them to do so. One in five of those surveyed felt that their programme does not have enough slit lamp capacity, and amongst this group, none are currently using senior graders for SLB. NDESP's SLB Examiner Training and Accreditation Framework sets out guidance for the training and supervision of slit lamp examiners, and compliance with this guidance was found to be very good, with 97% of Clinical Leads stating that their slit lamp examiners have completed this. The role of the DESP Clinical Lead varies greatly between programmes in terms of the amount of time dedicated to the role and the proportion of that time spent on grading activities. Regular feedback and support for graders was a common theme, however, and consistently occurs across most DESPs. The proportion of grading undertaken by different staff groups is based on the general impression of the Clinical Lead and should not be taken as an exact figure, however this data suggests that senior graders in England may now be undertaking more ROG than ophthalmologists. This indicates a significant change from the early days of the national programme. The training and criteria used to assess a grader's suitability for this role is determined locally and is therefore likely to vary from programme to programme. Given that almost three-quarters of DESPs now appear to be using senior graders to complete a proportion of the ROG workload, some form of standardised training or national guidance may prove a welcome addition to the mandatory qualification that exists for all graders. A training and accreditation framework is already in place for slit lamp examiners, and is widely utilised. Given the comparatively small proportion of SLB surveillance currently undertaken by senior graders and a lack of slit lamp capacity at some programmes, there is great potential for an increase in the training of senior graders to perform slit lamp in order to meet service need and improve staff development. OCT assessment is not a mandated part of the eye screening pathway and the number of senior graders currently involved in OCT interpretation appears to be very small. Future changes to the screening pathway which may include the use of OCT are therefore likely to have a significant impact on Clinical Leads, and may necessitate the further development of graders and other staff in order to meet demand. In conclusion, this survey suggests that the roles of Clinical Leads and DESP grading staff are evolving over time, and that graders are increasingly being developed to undertake higher level grading and other clinical activities that may previously have been performed by ophthalmologists or optometrists. There appears to be a clear opportunity, therefore, for organisations such as BARS and NDESP to support this training and encourage the development of grading staff in order to meet an ever-increasing service demand.